by Staff Writer Alex D.
Pizza, gelato, and churches. Those were some of the things a number of students from ISKL got to experience first hand as various musicians travelled to Italy over spring break. A music trip months in the making, the rehearsals started early, and the students worked tirelessly to get ready for the trip of a lifetime. “The rehearsals were definitely challenging,” Ms. Meininger said smiling. “Everyone had different schedules and we had people coming from eight ensembles, and all the instrumentalists had to learn how to sing, because they only allow vocalists in the Vatican. But I was really impressed with how quickly they learned.” Spending two days in Venice, two days in Florence and another day in Rome, the students felt the trip fly by too quickly, all the while holding onto the memories and experiences they collected. While enjoying to food and culture, the students of ISKL also performed at various locations throughout Italy. After working for months on the music, their efforts came to fruition– performing at three churches, cultivating in a performance at St Mary’s in Rome. “I felt like the performances went well. We weren’t sure how they were going to go but for the most part they turned out alright.” Joel ‘17, a musician on the trip stated. 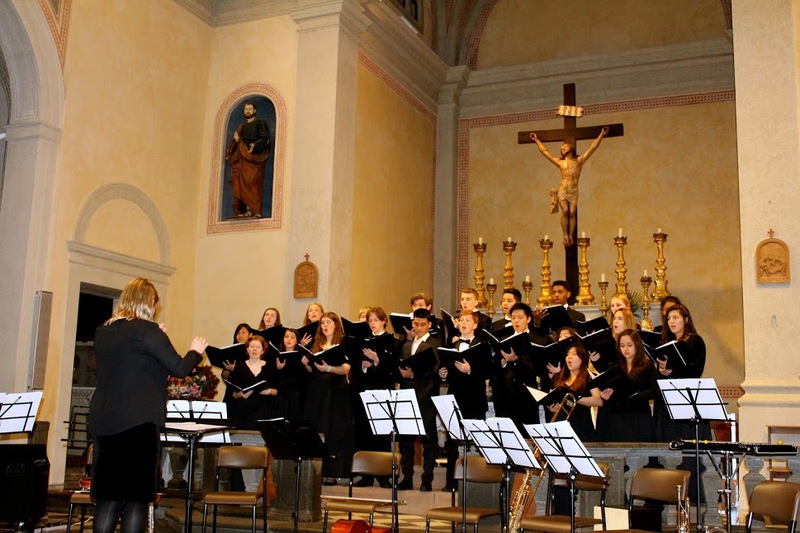 The ISKL musicians performed at two churches, one near Venice and another in Tuscany, keeping their time occupied as they balanced practices and performances, and touring and sightseeing all that Italy has to offer. Through all the highlights of the trip, there was however, one disappointment. The day before the concert at St. Peter’s Basilica in the Vatican, one of the Cardinals died, prompting the temporary closure of the church just in time to stop them from performing. “I was pretty mad, because being a Christian, St. Peter’s is the biggest place you can perform, and we didn’t get to,” said Joel. The Cardinal died on April first, and while many students hoped this was the case, it was not an April fools prank, and they could not perform at the Vatican. “But I mean, I think we all understood, because you know, someone died.” However, as they say, the show must go on. “The tour company was able to book us the second biggest church in Rome, pretty much right after we got word that St. Peter’s was going to be closed, which I was really impressed with.” Ms. Meininger stated. Other than the music performances, the trip was filled with tours that kept the students busy, and students had various highlights from the trip. “I really loved the tour of Rome. There was so much cool stuff there, like the Colosseum and the ruins from the Romans.” Joel mentioned. “But there was too much walking for a music tour.” The students toured around all the cities, seeing the islands of Venice, the Statue of David in Florence, and all there is to see in Rome, as well as even touring the Vatican. “I also prom-posed in Italy, so that was definitely a highlight.” Joel added. Through all the pizza and music, there was an element of bittersweetness to the trip. Both of the directors – Ms. Meininger and Mr. Chisholm will both be leaving ISKL after this year, and this was their last music tour at ISKL. “It was a little nostalgic. I really enjoyed the trip, but I did know this was going to be the last I go on. It was a special trip with a special group of students, but yes [it was] sad.” Ms. Meininger expressed.